November, 2012 | H&R Group K.K. Mt. Fuji Is Not Just A Mountain To Be Climbed!! However, there is actually much more to do around Mt. Fuji than just climb it or take photos of its beauty and perfect form in the distance. Did you know that Fuji is also famous for the 5 lakes that surround it; Lake Motosuko, Lake Shojiko, Lake Saiko, Lake Kawaguchiko and Lake Yamanako, known in Japanese as “Fuji Go-ko” (ko being “lake” and go being “five”)? If you are into walking there are many wonderful walking courses around all of the lakes that offer stunning views. On the shores of Lake Kawaguchiko sits Fuji’s best hotel; Fuji Lake Hotel. You can choose views of the lake or views of Mt. Fuji; both are scenic, picturesque, and beautiful. They offer great breakfast and dinner packages, and the hotel is used to and comfortable with foreign guests. The hotel is centrally located and a convenient starting place from which to visit the many museums in the area. If you are looking for a bit more excitement than a walk in by the lake or a cup of coffee under the mountain you might enjoy some roller coasters and amusement park fun! One of Japan’s most popular, and apparently “scary,” amusement parks is “FujiQ Highland” The official website is here; http://www.fujiq.jp/en/. Just be ready to spend the day with a lot of very young people! All of the above can be accessed very reasonably from Nagoya by FujiQ bus (the Nagoya part is not on their English website) for just 4,000 yen (one-way). There are only a couple of buses per day, but the rate of 4,000 yen is very reasonable. In summer, camping in the area is fantastic. There are a variety places to camp available, especially around Lake Yamanako. Though it hardly needs to be mentioned, like anywhere else of note in Japan the area boasts a number of great onsen to choose from. If you can go by car, do so. there is much more to do and see by car! Fuji Safari Park is a really fantastic place to get your Japan jungle experience. I have never seen lions and tigers up so close! After driving through the safari zone there is a really good “interactive zoo” to wander around that your kids will really enjoy! Half a day is probably a good amount of time to spend at the Safari Park. Just up the road from the lions and tigers there is a very kid friendly amusement park called “Grinpa.” While FujiQ is more adult orientated, Grinpa is aimed at younger children. There is a great indoor “play pen” for toddlers and pre-elementary kids that is chocker full of all sorts of kids toys, books, games and more. These two parks are over the other side of Mt. Fuji towards Gotenba, and can be easily accessed from the “New Tomei No. 2 Highway”. The “Shin-Tomei (New Tomei) is a pristine highway with state of the art rest areas and some of the best tunneling infrastructure you have ever seen. If you are looking for a great weekend getaway location why not make the trip to Mt Fuji and experience some of these lesser known, but absolutely fantastic locations? Mt. Fuji; its not just for looking pretty and climbing anymore! 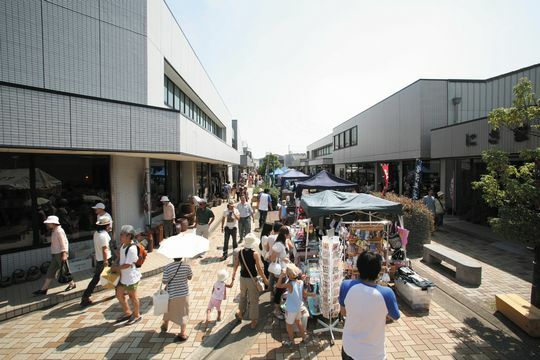 Cera Mall” is a wholesale pottery shopping park in Tokoname City, on the Chita Peninsula. What is “tokoname yaki?” Tokoname Pottery, or tokoname-yaki ware has been produced in the city of Tokoname, Aichi Prefecture for over 1,000 years. Originally, items such as vases were fired without glaze. Later, Tokoname ware became famous for the production of earthenware pipes, and is now widely known for pottery using red clay. 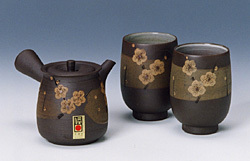 Tokoname ware was designated an official Japanese traditional craft in 1976. The ceramics on sale range from top-of-the-range handcrafted masterpieces, through to 3 for 100 yen type pricing for slightly defected or older items. The items available include cups, sauces, and plates right through to big items such as umbrella stands, large pots for outside gardening and even decorations for Christmas and New Years (obviously depending on the season). I am not a great shopper at any time of the year, but this is one of the places I really enjoy wandering around. I especially enjoy the bargains available on a lot of rice bowls, plates (small and large) and it is a common place to go to pick up an omiyage to take back to New Zealand for my family. I have also introduced newly wed couples to Cera Mall on many occasions, as it really is a great place to fit out your kitchen if you don’t have one yet….. cheaply, but nicely! If you have a little time on your hands, this is a perfect place to visit before or after the beach in Utsumi, or some of the fish markets in the south of Chita Peninsula. Look out for the Tokoname Pottery Path also, if you are a real ceramics fan! This is the Google Map! Whether you only know about ramen in its instant, cup-o-noodles variety, or are a true aficionado who can tell the difference between shoyu and tonkotsu based ramen by smell alone, perhaps you’ll agree: Ramen is so good, it should be in a museum. Well you’re in luck — there is a ramen museum! At the Shin-Yokohama Raumen Museum (not a typo; that’s how it is spelled), not only is the steamy, hearty goodness that is ramen soup memorialized, but the entire culture that created it is showed off as well. Ramen (Rau-men in the case of the museum) is considered by many to be a Chinese dish, hence the name “chuuka soba,” but like most things in Japan, it’s actually a take on an old idea that has become essentially Japanese. It consists of Chinese-style wheat noodles served in a meat or (occasionally) fish-based broth, often flavored with soy sauce or miso, and uses toppings such as sliced pork, dried seaweed, ginger, green onions, and so on. You can find a ramen shop in almost every nook and cranny of Japan, but the ingredients will change based on locality, for example Kyushu’s tonkotsu (pork-bone broth), Tohoku’s shio (salt-based broth), Hokkaido’s miso blend base and even Yokohama’s shoyu (soy sauce) based broth. This is where the Ramen museum shines; there are 9 famous ramen shops representing the best tastes of their respective region of Japan. In other words, you can skip the plane ticket and go on a gastronomic tour of Japan without leaving the building. But wait, this is a museum right? Of course, and that means you’ll get to learn how ramen came to be in the mid-20th century… by actually visiting 1950′s era Japan! Inside the museum’s main halls, they’ve recreated a scene from postwar Japan in the form of a massive two-floor diorama, complete with characters representing the time. As you descend the stairs, you’ll hear calls from the “police officer” walking his beat, making sure all is well. You’ll also see street vendors and carnies plying their trade too (don’t miss the guy selling the steamed sweet bread!) There’s even a 50’s era sweet shop, complete with snacks and other goodies. Even if you don’t slurp a single mouthful of noodles, you’ll come away entertained and you’ll learn a little something too. But you did come to eat right? Make sure you pack your appetite; you’ll want to visit more than one shop, as each has its own specialty. On my visit, I chose to try Hokkaido’s style of miso ramen from Sumire, a shop in Sapporo, and then taste Kyushu’s best tonkotsu soup from Kurume, a shop just outside of Fukuoka. I was doing the equivalent of going from one end of Japan to the other – in only 100 meters. It’s also important to note that every shop inside serves half-bowls of their soups since they know the crowds are there to enjoy tasting the different flavors. However these are true full-service restaurants; every item on their menu is available, including gyoza dumplings, fried rice, beer, and more. On the first floor there’s a museum shop stocked full of things like official ramen bowls, dishes and the like from all the representative restaurants, trinkets like cell phone straps, t-shirts, and even ramen meal kits that allow you to make bowls of noodle soup in your own kitchen. There’s also a slot car racing setup to occupy kids of all ages as well. The museum is easily accessible from JR’s Shin-Yokohama station on the Tokaido Shinkansen, JR Yokohama line, and Yokohama Subway Blue Line. From the station, it’s an easy 10-minute walk to the venue. Admission is only JPY 300 for a day pass (kids up to junior high age are half price). Also remember to bring money for the shops inside; average price for a whole bowl was JPY 900 and half-bowls were around JPY 600. If you’re looking for a good afternoon outing and are a bit of a “foodie” then this is the day trip for you. Perhaps you’ll understand why ramen is fast becoming a Japanese dish that can even compete with sushi on the global stage. The path begins about 5 minutes walk on the east side of Meitetsu Tokoname Station. From there you can enjoy the promenade beginning at the Ceramic Hall. The total walking course is about 1.5 km -0.93miles, and takes roughly 60 minutes. The meandering path winds through a labyrinth of roads through unique Tokoname. You can visit many of the workshops and studios, and see a wide variety of pottery; from the centuries old, to the brand new. From cheap, to exorbitant. The earthen pipes and shochu pots are especially famous. Many historic and new means of pottery production, such as kilns and brick chimneys, line the path as well. Volunteer guides are available to gide you through the popular Pottery Path in both Japanese and English, though reservations are required. To reserve please call – 0569-34-8888. While you are there, why not check out the Cera Mall; a Tokoname Pottery Wholesale Park. It is a comprehensive pottery-ceramics shopping zone, which is the largest in scale and variety on Chita Peninsula for ceramics.